The Happy Jungle slot has five reels and 20 paylines. On the drums, you will meet various inhabitants of the Jungle, as well as the penguin. Wild is a lion, forms combinations by itself and replaces other symbols to form advantageous combinations. Scatter, does not depend on active lines. Accordingly, payments on it are accrued irrespective of its location. And the winnings are calculated at the general rate for the round. Bonus, launches a prize round. It starts if three such pictures are simultaneously on the drums. Their location does not matter. 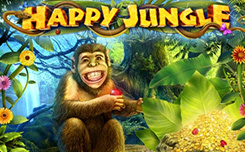 In the bonus game video slot “Happy Jungle” four levels. On each of them you need to choose one of the cells, if there is fruit in it, the game goes to the next stage. If it’s empty, the game ends. After four stages, the user becomes the owner of twenty-five free-spins. The game has high-level graphics, a cool interface with a convenient panel, numerous advantageous options for the gameplay, solid payout ratios and many other advantages.